You are here: Home » MEDIA » Books » Combat Aircraft 76: Lockheed SR-71 Operations In The Far East by Paul F. Crickmore (book review). 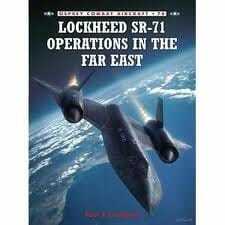 Combat Aircraft 76: Lockheed SR-71 Operations In The Far East by Paul F. Crickmore (book review). I did wonder when I started this book, ‘Combat Aircraft 76: Lockheed SR-71 Operations In The Far East’ by Paul F. Crickmore, as to what would it cover about the famous stealth surveillance Mach 3.1 Blackbird, also called the Habu, nicknamed after a dark poisonous put viper, by its pilots. The SR-71 was the replacement for the A-12 single seater surveillance aeroplane, with the most major change in its design to become a two-seater to carry a Reconnaissance Systems Officer in the back on September 1966 and looking at the illustrations also became its more familiar black colour. Crickmore is an authority on the SR-71 and an honorary member of the Blackbird Association with access to the various flight crew members. As such, his detailing of their various Far East sorties as they learnt to get the most out of their missions comes from a direct source. There were various teething troubles either involving troublesome instrumentation or the engines not firing while in the air. The pilots sought solutions to complete their missions, especially as the nature of their missions meant they couldn’t always call the ground for assistance, except on the way back when they had to land at alternative bases. The vivid descriptions will keep you reading until the end of each mission. The arrangements for each mission was for two SR-71s to be ready at the same time so if one couldn’t go, the other was available. It took two years before they were attacked but it didn’t really concern them because the missiles never came close before detonating. Flight patterns had to be changed when exploring the fringes of Soviet defences and the description of how two Habus switched flight runs showed some strategic planning and some superb split-second piloting as their paths crossed at Mach 6. No, the Blackbird didn’t suddenly become a lot faster, just the way it would be as they sped away from each other at Mach 3. Don’t be put off by the size of this book. It’s clearly not aimed at a young adult audience but at aircraft enthusiasts. The balance of two column text with photos and illustrations by Chris Davey give a whole rounded experience here that would be too spacious in a bigger book. The Blackbird has always been seen as one of a kind and, even when it was finally decommissioned, still held the record for the fastest flying aeroplane. No wonder it’s held a fascination over the years amongst us. If you need some insight into what it was like to fly this plane as well as its Far East missions then this book is worthwhile read. What’s the bet that the Mach 6 planes are drones. Without the need to carry crew, there would be less problems with going faster. « Doctor Who: The Mark Of The Rani by Pip and Jane Baker (DVD review).